With the explosion of life on the sidewalks of Hanoi, markets of fresh produce laid out every few blocks or sometimes just on the back of a bicyle, chickens in the form we rarely see -- alive, romantic cobblestone streets strung with glowing lanterns in dreamy Hoi An, water buffalos and wild boars casually sharing space with tribal village kids in the misty hills of Sapa, and an entire nation preparing for the biggest holiday of the year, sensory overload was constant. And wherever we went, we ate beautifully. I got the sense that the country has a mature food culture. Beyond the perfect balance of flavors in pretty much ever dish we tasted, there seemed to be a functional understanding of food. A tour through Hoi An's market led us to the spice lady, and our guide described each item's benefits -- some offer heat, some are cooling, others heal an upset stomach or a sore throat. 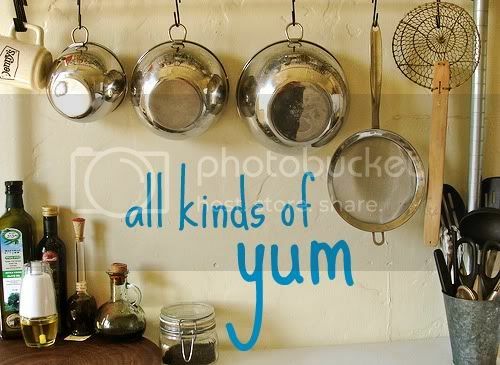 Some dishes are for winter, others for summer. A tiny bowl of a fish-sauce-based dressing -- its salty intensity balanced with sugar, lime juice, and chili -- accompanied pretty much every meal. As did fresh herbs: a big plate of various basils, mint, etc. accompanying many meals was a comforting call-back to Persian sabzi khordan. And every morning began the same way: with strong, dark filter coffee smoothed out with sweetened condensed milk. I grew to crave it. I still crave it. There was so much to grow enamored with on this trip. I could write pages and pages. To narrow it down, I'm going to focus on food, but man, even that's going to be hard. Anyhow, here we go. Hanoi brings new meaning to eating locally. Produce markets can be laid out on a sidewalk, on the back of a motorbike, or like this case, in baskets slung over the shoulders of of the seller. The greens in this photo are pretty familiar to western eyes. Whereas this bicycle vendor sells knobby, gnarly Buddha's hands, a staple in every temple's offering. I had my first taste of the arrestingly beautiful dragonfruit on this trip. Don't be fooled by appearances. Baskets of citrus, chilis, and other aromatics on a sidewalk in Hanoi. The bright red ginger-looking roots in the foreground are fresh turmeric. And next door, grains and chestnuts. Madame Hien in Hanoi felt like an oasis. French chef marries Vietnamese woman, applies French techniques to his mother-in-law's recipes. All in the lovely courtyard of a colonial building. These spring rolls were bright and fresh. Bun Bo Nam Bo. Cold vermicelli noodles with beef, bean sprouts, crispy fried shallots, herbs, amazing fish-sauce dressing (nuoc cham). So cheap (as in, 75 cents for a beer), so good. Ruined me for stateside Vietnamese food forever. Cha Ca Thang Long. Turmeric-marinated fish, mounds of fresh dill and scallions. Served with noodles, peanuts, chilis, cilantro, and another perfectly balanced nuoc cham. This dish with its turmeric, dill, and scallions brought to my mind the flavors of sabzi polo mahi, once again bridging the gap from Persian New Year to Lunar New Year. Tiny plastic benches on the sidewalk are a sure sign of something good. 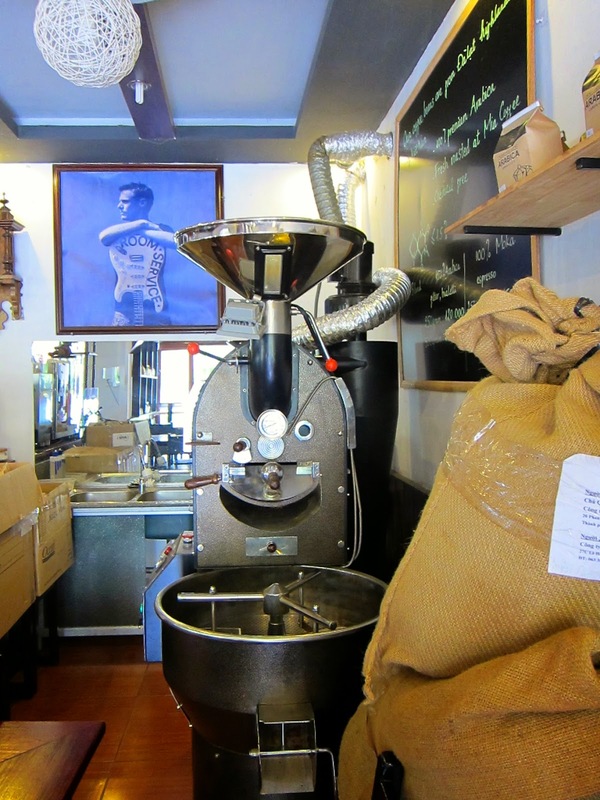 In this case, it's a cafe where all the Hanoi cool kids get their caffeine and peoplewatching fix. Banh cuon are thin rice rolls filled with ground pork and woodear mushrooms, and topped with crispy shallots and lots of fresh cilantro. Bun cha are charcoal-grilled pork patties served with vermicelli, fresh garlic and chilis, and of course, loads of fresh herbs and lettuces. A sleeper train from Hanoi took us way north to Sapa, a misty, damp hill town with abundant waterfalls, friendly water buffalo, and ethnic minority villages tucked into the valleys. The climate chilled us to the bone, but locals battled the cold with warm infusions. As soon as we stepped into our hotel, we were greeted with hot spiced apple cider, and at breakfast, this ginger lemongrass infusion thawed us out. Breakfast in chilly Sapa. The only thing that could pull me out of my heated bed (Yes, that's right, heated bed.) was a steaming bowl of noodles. Sapa feels run down and past its prime, but the Hill Station Signature restaurant is an immaculate exception. Focusing on the abundance of local produce, meats, and fish, at its center is a cozy wood-burning oven. Here I discovered susu, a pale green local vegetable that was bright, slightly nutty, and cooked perfectly. Stewed eggplant and rice at Red Dao House in Sapa. The Red Dao are a local ethnic minority, and this restaurant was a delicious introduction to their cuisine. Hai Cafe: Huge courtyard, tables full of white people, and all the food came from this tiny outdoor kitchen and this badass woman chef. Hoi An has quite a few local specialties, and Trung Bac is a fun, kitschy place to try them all. 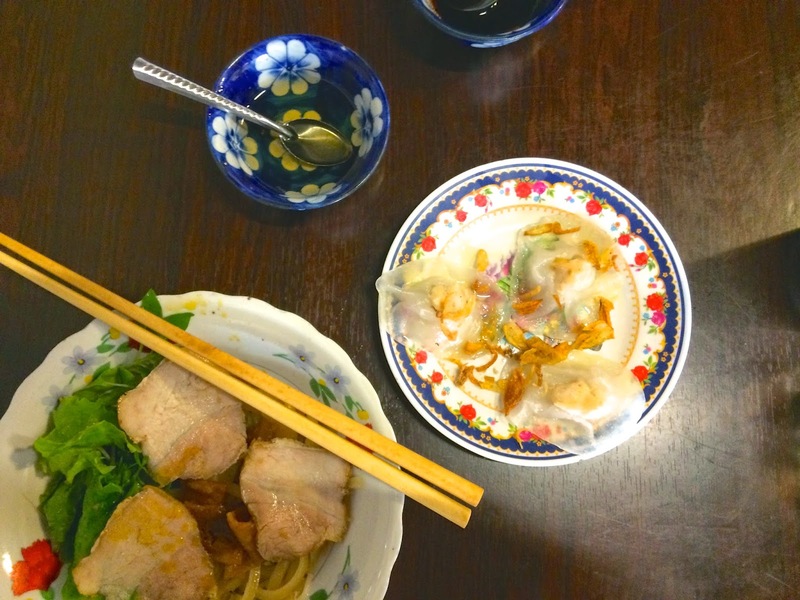 Here are cao lầu, a noodle dish, and delicate white rose dumplings. Grace under fire at Hoi An's central market. The carrots in Vietnam are fat and bright and look like something out of a Beatrix Potter book. I love them. Noodles galore at the market in Hoi An. 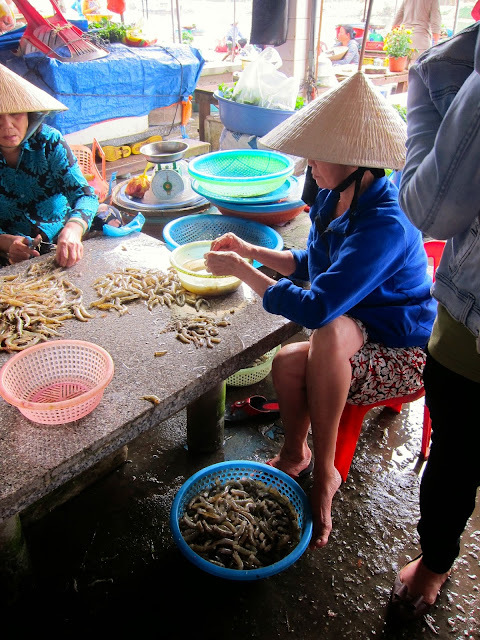 We took a cooking class in Hoi An, which included a tour of the market and hands-on instruction. I made this light soup with a little cabbage packet of minced shrimp. And this ban xeo, a fried, eggy pancake with turmeric and coconut milk. The fruit on top is a slice of green banana. And this amazing barbecued chicken over a green mango salad. Traditional Vietnamese coffee, its bitterness balanced with sweetened condensed milk, was a treat we enjoyed every single day. But for classic espresso drinks, and beans to bring home, Caffe Mia was the spot. Local beans roasted right in the shop in this smiley roaster. 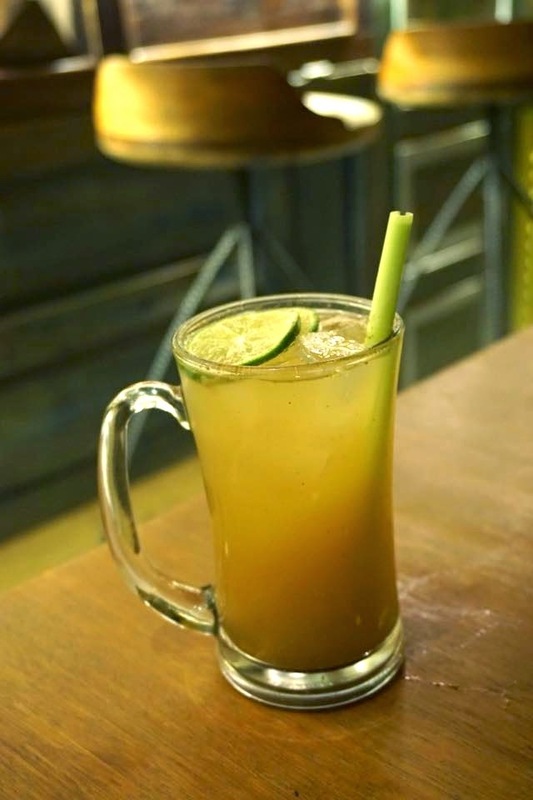 Cocobox handles Hoi An's hipster cafe/juicery needs. Cold pressed juices, fresh baked goods, lots of great food gifts, and this utterly refreshing lemongrass lime ginger iced tea. A fancier rendition of Vietnamese coffee. Now that I'm home, my fridge has a few new inhabitants: sweetened condensed milk, coconut milk, and of course, stinky beloved fish sauce. (I hope they don't get too sad when I shut the refrigerator door.) A couple weeks in Vietnam are nowhere near enough, but I think the best kind of travel leaves you curious for more. I'm certainly still hungry. Thank you very much for interesting article. If you are looking for best Vietnamese restaurant in Hoi An Ancient Town, inspect and consider to book with this Hoi An restaurants.